The Fargo DTC1000M has been discontinued. No direct replacement is available. MONOCHROME PRINTER, Single-sided, MAG STRIPE, ETHERN. This part is also known as 047230. MONOCHROME PRINTER, Single-sided WITH Ethernet. This part is also known as 047220. Monochrome, Single-sided printer with magnetic stripe encoding, USB Connection with Three Year Printer Warranty. This part is also known as 047210. 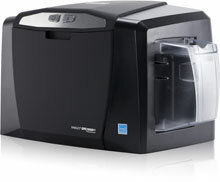 Base Model, Monochrome, Single-sided printer, USB Connection with Three Year Printer Warranty. This part is also known as 047200.